Shocks are hydraulic pump-like devices that help control the impact and rebound movement of your vehicle's springs and suspension. Shocks are responsible for preventing your car from bouncing and keeping your tires in contact with the road at all times. MAP (Motorist Assurance Program) guidelines recommend replacing Original Equipment shocks and struts after 50,000 miles because independent testing has shown a measurable drop in performance of stopping distance up to 10. Shocks take the movement of your suspension and convert it to thermal energy. This energy, or heat, is dispersed into the atmosphere through heat exchange. Shocks adjust to road conditions to provide more resistance the faster the suspension is moving. 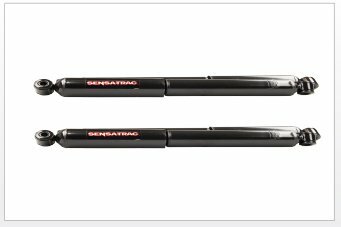 Three types of shocks: conventional telescopic shocks, strut type shocks, and spring seat shocks. Utilize a hydraulic pump-like device. Tougher to tell with shocks, so have them inspected regularly by a professional. Excessive bounce, sway, or dive during breaking. Tires wearing unevenly in a "cupped" wear pattern. Limited ability to stop, steer and maintain stability. Reduced rate at which your vehicle transfers among the wheels when cornering or braking. 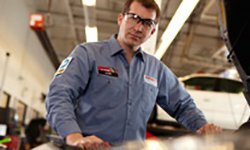 If you have questions or concerns about shocks or any of your vehicle’s components, come into your local Pep Boys where we can answer any question, help you find any part, or perform any vehicle service you might need.